(Bloomberg) -- An “unsustainable” increase in the United Arab Emirates’ lending benchmark will reverse once the government doles out the tax revenue whose withdrawal from deposits spurred the rise, according to the biggest bank in Dubai. 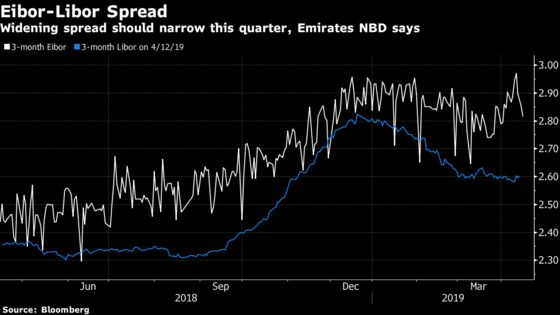 The three-month Eibor has climbed in the past three weeks despite a decline in a similar dollar rate, an oddity because the dirham is pegged to the U.S. currency. The spread with the three-month Libor widened to 36 basis points last week, the biggest differential in more than two years, according to data compiled by Bloomberg. The government probably held as much as 40 billion dirhams ($11 billion) in bank deposits following the introduction of a 5 percent value-added tax in early 2018, and cash built up because the distribution of the proceeds to individual emirates had yet to be finalized, Yadav said. The outlook for interest rates in the U.S. is another factor that should push borrowing costs lower in the U.A.E., according to Yadav. Federal Reserve officials in March forecast no rate increase this year and just one in 2020, according to their median estimate. That marked a pivot from their December forecast that signaled two hikes in 2019. “In such an environment, given the dirham’s peg to the dollar, interbank rates in the U.A.E. theoretically should also have come down or remain range bound with respect to the recent decline in Libor rates,” Yadav said.